There have been so many beautiful spring home tours throughout blog land in the last couple of weeks and today I'm sharing my mini spring tour. We are starting in the foyer where Mango the cow is still here to greet you. The only change on top of the chest is the ivy has been swapped out for this stag horn fern in a pretty concrete planter I have had for years. Across from the chest I swapped the chair that was here with this antique one that was by the fire place. I may need to lower that painting a bit even though it looks okay in person. Right past the chest is a French style bench and a favorite huge demijohn. A blue striped vintage mudcloth pillow and the green demijohn are in keeping with the blues and greens I have added in the great room which I will share soon. While changing up things in the great room these beads had no where to go so I just wrapped them over this large demijohn. I say why not? Now let's back up and turn right into the dining room where I have made some simple changes. You will notice I changed up some of the shelves on the hutch. I had some of my ironstone collection on them, but moved some of those and added my blue and white jars and some books. It's a nice change after months of being the same way. There's nothing like pretty flowers for spring and theses faux orchids in this pretty blue and white bowl fit the bill nicely. I won't be able to kill this plant like I did the real thing. Did you notice I also updated the chandelier? I bought these Aidan Gray chandelier wooden tassels and hung them on the chandy to dress it up a bit. This corner basically stays the same. Vintage bread boards and demijohns dress the top of an antique armoire which was our first antique purchase back in the seventies. Some flowers and boxes were added on top of the blue buffet. If I can ever get around to it I may paint the yellow ceiling white dove like the walls. For now yellow it is. More spring rooms coming your way soon. Love the blue and green. The changes in the hutch look great. Beautiful Spring decor Kim....I love the newly re-decorated hutch....Now I am going to assume you will be showing us where you have relocated the pretty tureens! Happy Spring! Love the orchids where did you buy them? I am in love with the changes you have made in these rooms! The subtle blues and greens are just enough to set off the neutrals to perfection! Definitely one of my very favorite tours this spring!!! This is my favorite look for your dining room. I love this hutch in here and I also love how you paired the wicker chairs with the table too. Gorgeous. Love your changes for Spring! Everything looks totally fab! Beautiful spring updates, Kim. I am loving how all the dark wood in the dining room looks against the light walls. And I kill orchids too...actually I kill most plants. Enjoy your day! Your dining room looks beautiful Kim! It looks beautiful. I love all of the updates. The spring refresh looks fabulous! 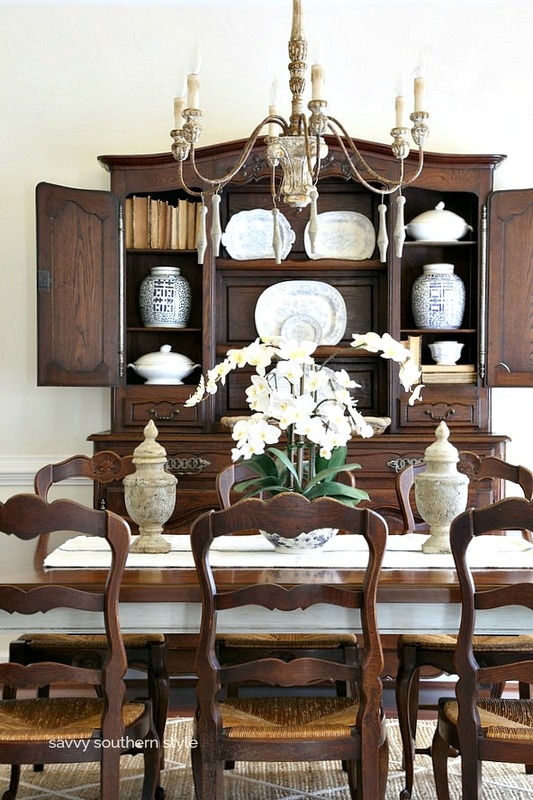 The dining room hutch is lovely in any season! So beautiful Kim. Your dining room hutch is beautiful too. Happy Easter. I personally love the yellow ceiling! Do you have high ceilings? I’d love to paint mine black but it’s an 8 foot.... not sure! Any ideas, anyone! That ceiling is 9 feet tall. So many beautiful things to love here! I think my favorite is your antique armoire with the demijohns. Also loving that needlepoint pillow. Happy spring! So pretty Kim! Love the blue and green touches. Everything looks great Kim. Loving the tassels on the chandelier and the armoire you purchased in the 70's.